Zanzibar Kayaking in Paradise with Zanzibar Yacht Charter. Join us today. Enjoy Zanzibar Kayaking on one of our Day Trip Yacht Charter to Tumbatu Island or the Mnemba Island Atoll! 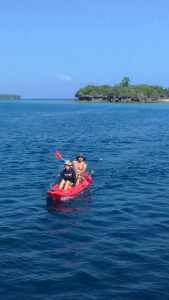 Likewise should you be cruising the inland lagoon areas of Pemba Island on one of our extended Live Aboard Safaris, we have some great Kayaks available for you and the family to use. Join one of our crew members as a guide and go and explore these stunning inland lagoon areas and Mangroves Creeks of Pemba Island. 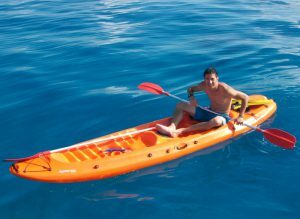 The Synergy is a versatile two-seater kayak that can also be paddled solo. Additionally its length makes it fast and extremely efficient. It features a tri-hull design making it super stable, while the subtle keel assists tracking. It punches through waves and ensures maneuverability due to its rocker profile and lifted bow. Furthermore, it ensures that even two heavier paddlers can paddle it due its high carrying capacity. Ours is fitted with two rod holders! So take along a fishing rod for some extra fun out on the water! 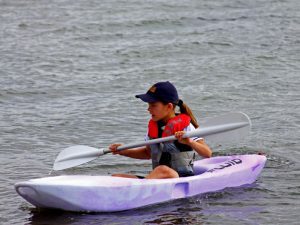 The Vaya is a playful kayak specifically designed for kids. It is maneuverable and forgiving, with great secondary stability. The Vaya tracks well due to the central channel of the hull and two moulded skegs. The lightweight construction and 4 handles make it easy to carry. Thanks to the moulded seat and footrests, young paddlers can jump on without any adjustments . Furthermore the recessed gear deck on the stern allows young explorers to load treasures they might find. The Vaya is virtually unsinkable due to it being a completely sealed unit. A perfect vessel for the kids to enjoy some Zanzibar Kayaking!